There are only two more rounds left in the Regular Season in LUB. The fans could enjoy quite many interesting games in the last round. The round ended with derby games and favorites losing the games. Here is the last round review presented by ESL. The game had a very big importance for second-ranked Malvin as it allowed them to take a leadership position. Malvin edged 5th ranked Olimpia in Montevideo 89-88. Malvin made 17-of-19 free shots (89.5 percent) during the game. Worth to mention a great performance of American forward Shawn Glover (201-90, college: ORU, agency: Haylett Sports) who helped to win the game recording 18 points and 8 rebounds. point guard Marcos Cabot (178-89) contributed with 15 points and 6 rebounds for the winners. 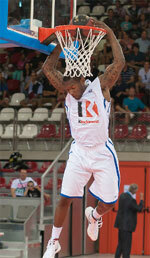 American Brandon Nazione (202-94, college: E.Michigan) answered with 20 points and 6 rebounds for Olimpia. As mentioned above they are alone now at the top position. Olimpia at the other side dropped to the sixth place with nine games lost. Just two games before the end of Regular Season and it may be the most important game of the season next round when Olimpia faces Goes trying to get back on the winning streak. It will be a derby game for which supporters look forward to, where their team will face at home their local rival from Montevideo - Goes. Malvin will try to continue on its current victory against fourteenth ranked Verdirrojo. It will be extra interesting game as Verdirrojo is their local rival from Montevideo. Another exciting game was a derby match between two teams from Montevideo: Aguada (#5) and Trouville (#6). Aguada (15-8) won against visiting Trouville (14-10) 84-77. It ended at the same time the five-game winning streak of Trouville. Forward Demian Alvarez (192-84, agency: Pro Sports) stepped up and scored 21 points and 7 assists for the winners and Ricardo Glenn chipped in 21 points and 6 rebounds. At the losing side American center Paul Harrison (203-89, college: N.Greenville) responded with a double-double by scoring 20 points and 14 rebounds. Trouville's coach Alvaro Tito rotated ten players in this game, but that didn't help. Aguada maintains fifth place with 15-8 record. Trouville at the other side dropped to the seventh position with ten games lost. They share it with Hebraica. Aguada's supporters look forward to another derby game next round, where their team will face at home their local rival from Montevideo Hebraica. Very important is a road loss of third ranked Urunday Univ. (16-7) against ninth ranked Goes (13-11) on Tuesday night. Visiting Urunday Univ. was defeated by Goes in Montevideo 93-83. It ended at the same time the two-game winning streak of Urunday Univ.. Jarred Shaw nailed 19 points and 9 rebounds for the winning side. Tyrone Lee came up with 25 points and 7 rebounds for Urunday Univ. in the defeat. Goes maintains ninth place with 13-11 record. Loser Urunday Univ. keeps the third position with seven games lost. Goes' supporters look forward to an exciting derby game next round, where their team will travel locally in Montevideo to the arena Olimpia. Bottom-ranked Sayago managed to get the second consecutive victory. This time newly promoted Sayago outleveled eleventh-ranked Atenas 99-79. It's especially surprising that the victory came too easily and 20-point difference proves that Sayago was well-prepared to that game. Calvin Warner fired a double-double by scoring 28 points, 15 rebounds and 4 assists for the winners. Atenas' coach tested eleven players seeing no chance for a win. Sayago (3-21) moved-up to thirteenth place. Atenas at the other side, also newcomer in the league, keep the eleventh position with 16 games lost. Sayago's next round opponent will be league's second-placed Nacional in Montevideo and it will be quite challenging to get another victory. LUB top team - Nacional (17-6) had no problems winning another game on Monday. This time they crushed thirteenth ranked Verdirrojo (2-21) in Montevideo 103-60. It was a very good performance for Mateo Sarni who helped to win the game recording 14 points, 8 rebounds and 9 assists. The winner was already known earlier in the game, so both coaches allowed to play the bench players saving starting five for next games. Nacional have a solid series of four victories in a row. Despite that victory Nacional went down to second position due to points difference. Verdirrojo lost eleventh consecutive game. Newly promoted team dropped to the bottom. Nacional will face Sayago (#13) on the road in the next round which should be another easy win for them. Verdirrojo's supporters look forward to an exciting derby game next round, where their team will face at home their local rival from Montevideo Malvin. In the last two games of round 25 Defensor beat Welcome on the road 90-82. Hebraica won against Bigua on its own court 77-69. Another exciting game was a derby match between two teams from Montevideo: Aguada (#5) and Trouville (#6). Aguada (15-8) won against visiting Trouville (14-10) 84-77. It ended at the same time the five-game winning streak of Trouville. Strangely Trouville outrebounded Aguada 35-23 including 24 on the defensive glass. Forward Demian Alvarez (192-84, agency: Pro Sports) stepped up and scored 21 points and 7 assists for the winners and American center Ricardo Glenn (203-90, college: USC Upstate, agency: HMS) chipped in 21 points and 6 rebounds. Four Aguada players scored in double figures. At the losing side American center Paul Harrison (203-89, college: N.Greenville) responded with a double-double by scoring 20 points and 14 rebounds and the other American import guard Donald Robinson (193-89, college: W.Virginia Tech) scored 25 points. Trouville's coach Alvaro Tito rotated ten players in this game, but that didn't help. Aguada maintains fifth place with 15-8 record. Trouville at the other side dropped to the seventh position with ten games lost. They share it with Hebraica. Aguada's supporters look forward to another derby game next round, where their team will face at home their local rival from Montevideo Hebraica. LUB top team - Nacional (17-6) had no problems winning another game on Monday. This time they crushed thirteenth ranked Verdirrojo (2-21) in Montevideo 103-60. They outrebounded Verdirrojo 47-31 including a 39-20 advantage in defensive rebounds. Nacional looked well-organized offensively handing out 25 assists comparing to just 7 passes made by Verdirrojo's players. Great defensive blocking was one of the keys in this match when Nacional made 7 blocks. It was a very good performance for guard Mateo Sarni (185-98) who helped to win the game recording 14 points, 8 rebounds and 9 assists. Forward Nicolas Delgado (198-87) contributed with a double-double by scoring 13 points and 11 rebounds for the winners. Five Nacional players scored in double figures. Center Martin Garay (196-95) answered with 7 points and 10 rebounds and guard J Mayora (180-95) added 13 points in the effort for Verdirrojo. The winner was already known earlier in the game, so both coaches allowed to play the bench players saving starting five for next games. Nacional have a solid series of four victories in a row. Despite that victory Nacional went down to second position due to points difference. Verdirrojo lost eleventh consecutive game. Newly promoted team dropped to the bottom. Nacional will face Sayago (#13) on the road in the next round which should be another easy win for them. Verdirrojo's supporters look forward to an exciting derby game next round, where their team will face at home their local rival from Montevideo Malvin. Bottom-ranked Sayago managed to get the second consecutive victory. This time newly promoted Sayago outleveled eleventh-ranked Atenas 99-79. It's especially surprising that the victory came too easily and 20-point difference proves that Sayago was well-prepared to that game. They dominated down low during the game scoring 64 of its points in the paint compared to Atenas' 40. They outrebounded Atenas 40-22 including a 33-15 advantage in defensive rebounds. Sayago players were unselfish on offense dishing 24 assists. American forward Calvin Warner (201-80, college: Jacksonville) fired a double-double by scoring 28 points, 15 rebounds and 4 assists for the winners. His fellow American import forward Duke Crews (203-88, college: Bowie St.) chipped in a double-double by scoring 24 points, 10 rebounds and 4 assists. Guard Alex Lopez (185-93) produced 27 points and American-Jamaican power forward Phil Henry (203-91, college: E.New Mexico) added 15 points and 8 rebounds respectively for lost side. Both teams had four players each who scored in double figures. Atenas' coach tested eleven players seeing no chance for a win. Sayago (3-21) moved-up to thirteenth place. Atenas at the other side, also newcomer in the league, keep the eleventh position with 16 games lost. Sayago's next round opponent will be league's second-placed Nacional in Montevideo and it will be quite challenging to get another victory. No shocking result in a game when seventh ranked Defensor (16-8) beat 12th ranked Atletico Welcome (5-18) in Montevideo 90-82 on Monday. Defensor outrebounded Atletico Welcome 40-29 including a 29-18 advantage in defensive rebounds. Atletico Welcome was plagued by 24 personal fouls down the stretch. Quite impressive performance for point guard Alejandro Acosta (186-89) who helped to win the game recording a double-double by scoring 13 points, 5 rebounds and 10 assists. American center Anthony-Laveal Johnson (203-88, college: Fairfield) contributed with 19 points and 6 rebounds for the winners. American center Nick Waddell (200-89, college: Grand Valley St.) answered with 28 points and guard Angel Varela (187-87) added 12 points, 8 rebounds and 4 assists in the effort for Atletico Welcome. Both teams had five players each who scored in double figures. Defensor moved-up to fourth place. Atletico Welcome lost fifth consecutive game. They keep the twelfth position with 18 games lost. Defensor's supporters look forward to an exciting derby game next round, where their team will face at home their local rival from Montevideo Trouville. Very important is a road loss of third ranked Urunday Univ. (16-7) against ninth ranked Goes (13-11) on Tuesday night. Visiting Urunday Univ. was defeated by Goes in Montevideo 93-83. It ended at the same time the two-game winning streak of Urunday Univ.. They outrebounded Urunday Univ. 39-24 including a 30-18 advantage in defensive rebounds. American center Jarred Shaw (208-90, college: Utah St.) nailed 19 points and 9 rebounds for the winning side and guard Fernando Martinez (170-79, agency: Pro Sports) accounted for 14 points, 6 rebounds and 8 assists (made all of his seven free throws). American forward Tyrone Lee (204-90, college: Grand Valley St.) came up with 25 points and 7 rebounds and the other American import Quinnel Brown (198-83, college: Auburn) added 17 points and 5 steals respectively for Urunday Univ. in the defeat. Five Goes and four Urunday Univ. players scored in double figures. Goes maintains ninth place with 13-11 record. Loser Urunday Univ. keeps the third position with seven games lost. Goes' supporters look forward to an exciting derby game next round, where their team will travel locally in Montevideo to the arena Olimpia. Rather expected game when 10th ranked Bigua (10-14) lost to eighth ranked Hebraica (14-10) in Montevideo 69-77 on Tuesday. Hebraica forced 19 Bigua turnovers. Quite impressive performance for forward Gaston Semiglia (191-91) who helped to win the game recording 30 points and 4 assists. Panamanian center Jaime Lloreda (204-80, college: LSU) contributed with a double-double by scoring 13 points and 13 rebounds for the winners. Hebraica's coach Matias Nieto used entire bench which allowed the starters a little rest for the next games. American forward Jeremis Smith (203-86, college: Georgia Tech, agency: Pro Sports) answered with a double-double by scoring 14 points, 11 rebounds and 5 assists and American guard Charles Hinkle (198-88, college: American) added 18 points and 6 rebounds in the effort for Bigua. Four Bigua players scored in double figures. Hebraica moved-up to seventh place, which they share with Trouville. Loser Bigua keeps the tenth position with 14 games lost. Hebraica's supporters look forward to an exciting derby game next round, where their team will travel locally in Montevideo to the arena Aguada. The game had a very big importance for second-ranked Malvin as it allowed them to take a leadership position. Malvin edged 5th ranked Olimpia in Montevideo 89-88. Malvin made 17-of-19 free shots (89.5 percent) during the game. Worth to mention a great performance of American forward Shawn Glover (201-90, college: ORU, agency: Haylett Sports) who helped to win the game recording 18 points and 8 rebounds. Point guard Marcos Cabot (178-89) contributed with 15 points and 6 rebounds for the winners. American Brandon Nazione (202-94, college: E.Michigan) answered with 20 points and 6 rebounds and the other American import forward John Dickson (198-90, college: Sacramento St.) added 19 points in the effort for Olimpia. Five Malvin and four Olimpia players scored in double figures. As mentioned above they are alone now at the top position. Olimpia at the other side dropped to the sixth place with nine games lost. Just two games before the end of Regular Season and it may be the most important game of the season next round when Olimpia faces Goes trying to get back on the winning streak. It will be a derby game for which supporters look forward to, where their team will face at home their local rival from Montevideo - Goes. Malvin will try to continue on its current victory against fourteenth ranked Verdirrojo. It will be extra interesting game as Verdirrojo is their local rival from Montevideo.